The origins of the Jews of Yemen remain obscure. One local Yemenite Jewish tradition dates the earliest settlement of Jews in the Arabian Peninsula to the time of King Solomon. Another legend places Jewish craftsmen in the region as requested by Bilqis, the Queen of Saba (Sheba). A more likely explanation is the spice trade: Yemen was a key point on the ancient trade route that brought spices and perfumes from India to Yemen and from there to Greater Syria through the Hijaz from the third century BC to the third century CE. Jewish merchants played an important part in this trade. The immigration of the majority of Jews into Yemen appears to have taken place about the beginning of the second century. According to some sources, the Jews of Yemen enjoyed prosperity until the sixth century. The Himyarite King, Abu-Karib Asad Toban converted to Judaism at the end of the 5th century, while laying siege to Medina. In 518 the kingdom was taken over by Zar'a Yusuf. He too converted to Judaism, and prosecuted wars to drive the Aksumite Ethiopians from Arabia. Zar'a Yusuf is chiefly known in history by his cognomen Dhu Nuwas, in reference to his "curly hair." Jewish rule lasted until 525 CE (some date it later, to 530), when Christians from the Aksumite Kingdom of Ethiopia defeated and killed Dhu Nuwas, and took power in Yemen. Islam came to Yemen around 630, during the Prophet Muhammad's lifetime. As Ahl al-Kitab, protected Peoples of the Scriptures, the Jews were assured freedom of religion only in exchange for the jizya, payment of a poll tax imposed on all non-Muslims. Active Muslim persecution of the Jews did not gain full force until the Shiite Zaydi clan seized power from the more tolerant Sunni Muslims early in the 10th century. The Zaydi enforced a statute known as the Orphan's Decree, anchored in their own eighth century legal interpretations and enforced at the end of that century. It obligated the Zaydi state to take under its protection and to educate in Islamic ways any dhimmi child whose parents had died when he or she was a minor. The Orphan's Decree was ignored during the Ottoman rule (1872-1918), but was renewed during the period of Imam Yahya (1918-1948). Under the Zaydi rule, the Jews were considered to be impure, and therefore forbidden to touch a Muslim or a Muslim's food. They were obligated to humble themselves before a Muslim, to walk to the left side, and greet him first. They could not build houses higher than a Muslim's or ride a camel or horse, and when riding on a mule or a donkey, they had to sit sideways. Upon entering the Muslim quarter a Jew had to take off his foot-gear and walk barefoot. If attacked with stones or fists by Islamic youth, a Jew was not allowed to defend himself. In such situations he had the option of fleeing or seeking intervention by a merciful Muslim passerby. The Jews of Yemen had expertise in a wide range of trades normally avoided by Zaydi Muslims. Trades such as silver-smithing, blacksmiths, repairing weapons and tools, weaving, pottery, masonry, carpentry, shoe making, and tailoring were occupations that were exclusively taken by Jews. The division of labour created a sort of covenant, based on mutual economic and social dependency, between the Zaydi Muslim population and the Jews of Yemen. The Muslims produced and supplied food, and the Jews supplied all manufactured products and services that the Yemeni farmers needed. The average Jewish population of Yemen for the first five centuries is said to have been about 3,000. The Jews were scattered throughout the country, but carried on an extensive commerce and thus succeeded in getting possession of many Jewish books. When Saladin became sultan in the last quarter of the twelfth century and the Shiite Muslims revolted against him, the trials of the Yemenite Jews began. There were few scholars among them at that time, and a putative prophet arose; he preached a syncretic religion that combined Judaism and Islam, and claimed that the Bible foretold his coming. One of Yemen's most respected Jewish scholars, Jacob ben Nathanael al-Fayyumi, wrote for counsel to renowned Sephardic Jewish theologian, philosopher, and physician from Spain resident in Egypt, Rabbi Moshe ben Maimon, better known as Maimonides. Maimonides replied in an epistle entitled Iggeret Teman (The Yemen Epistle). This letter made a tremendous impression on Yemenite Jewry. It also served as a source of strength, consolation and support for the faith in the continuing persecution. Maimonides himself interceded with Saladin in Egypt, and shortly thereafter the persecution came to an end. At the beginning of the nineteenth century the condition of the Jews of Yemen was miserable. They were under the jurisdiction of the local Muslim Imam, and they were forbidden to wear new or good clothes, nor might they ride a donkey or a mule. They were compelled to make long journeys on foot when occasion required it. They were prohibited from engaging in monetary transactions, and were all craftsmen, being employed chiefly as carpenters, masons, and smiths. At the beginning of the nineteenth century, they are said to have numbered 30,000, and to have lived principally in Aden (200), Sana (10,000), Sada (1,000), Dhamar (1,000), and the desert of Beda (2,000). The chief occupations of the Yemenite Jews were as artisans, including gold-, silver- and blacksmiths in the San'a area, and coffee merchants in the south central highland areas. Towards the end of the nineteenth century new ideas began to reach Yemenite Jews from abroad. Hebrew newspapers began to arrive, and relations developed with Sephardic Jews, who came to Yemen from various Ottoman provinces to trade with the army and government officials. There were two major centres of population for Jews in southern Arabia besides the Jews of Northern Yemen, one in Aden and the other in Hadramaut. The Jews of Aden lived in and around the city, and flourished during the British protectorate. The Jews of Hadramaut lived a much more isolated life, and the community was not known to the outside world until the early 1900’s. In the early 20th century they had numbered about 50,000; they currently number only a few hundred individuals and reside largely in Sa'dah and Rada'a. Emigration from Yemen to Palestine began in 1881 and continued almost without interruption until 1914. It was during this time that about 10% of the Yemenite Jews left. In 1947, after the partition vote of the British Mandate of Palestine, rioters engaged in a bloody pogrom in Aden that killed 82 Jews and destroyed hundreds of Jewish homes. Aden's Jewish community was economically paralyzed, as most of the Jewish stores and businesses were destroyed. Early in 1948, the unfounded accusation of the ritual murder of two girls led to looting. This increasingly perilous situation led to the emigration of virtually the entire Yemenite Jewish community between June 1949 and September 1950. During this period, over 50,000 Jews emigrated to Israel. In Yemen itself, there exists today a small Jewish community in the town of Bayt Harash. A small Jewish enclave also exists in the town of Raydah, which lies approximately 45 mile north of Sana'a. Celebratory gunshots rang out. Young men sprinted down the narrow streets of the capital, whooping with excitement. It was Feb. 25, 2012, and Ali Abdullah Saleh, who ruled Yemen for 33 years, had resigned — another autocrat toppled by the Arab Spring. As other Yemenis excited by the prospect of a new future filled Change Square, Suleiman Habib sat on the steps of his sparse home on the outskirts of the capital. Watching fireworks burst over the city, he contemplated whether his people’s more-than-two-millennia-long history in the country was about to end forever. A gaunt silversmith in his mid-60s and one of the last members of an ancient community of Jews living in Yemen, Habib was fearful of a future without the autocrat he saw as a guardian. Almost two years after the nation’s rebellion against Saleh, he feels no enthusiasm for his country’s democratic awakening. “Saleh was a despot. He ran Yemen like a fiefdom, he neglected people and stole natural resources, but as a Jew my family and I were protected by him. Who will do that now that he is gone?” says Habib. It’s a sentiment that resonates across the Middle East, where massive unrest has shaken governments from Damascus to Tunis but has also unleashed a wave of sectarianism. With Coptic Christians under attack in Egypt and religious and ethnic rifts hardening in Syria’s civil war, the region has become a more dangerous place for minorities. Looming large is the question of how these groups will fit into new social orders, if at all. Yemeni Jews say they reached south Arabia more than 2,500 years ago, as merchants sent by the legendary King Solomon to trade for gold and silver to adorn his temple in Jerusalem. For centuries they flourished, living in towns and villages alongside Muslims and working as carpenters, masons and silversmiths because they were largely excluded from other professions. Under the Shia imams who ruled Yemen for most of the past millennium, Jews were classified as dhimmi — non-Muslim citizens who had the right to reside and practice their faith in exchange for paying a tax. But there were pogroms, and Jews were set apart by law. In 1792, senior Muslim clerics ordered synagogues destroyed. By religious decree, Jews were forbidden to wear new or good clothes, were not allowed to bear arms or ride mules, and were forbidden from wearing jewelry or a jambiya, the traditional curved daggers worn by Yemeni men. 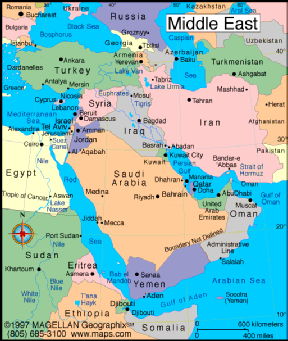 During the 1948 war that led to the creation of Israel, anti-Jewish sentiment rose in Yemen and across the Middle East. Rioters killed some 80 Jews in the port city of Aden and plundered most of the Jewish shops in the city. Consequently, 49,000 Yemeni Jews, about two-thirds of the community, were airlifted to Israel between 1948 and 1951 in a secret British and American mission dubbed Operation Magic Carpet. Today, as Yemen tries to navigate a path toward democracy and a more inclusive political system, the last wave of emigration looks to be under way. In August, the Jewish Agency for Israel, a semigovernmental Israeli organization, helped smuggle 17 Yemeni Jews to Israel. Less than 90 remain. Some of the last remaining Jews in war-torn Yemen have been brought to Israel in a secret mission. The Jewish Agency, which is responsible for Jewish immigration to Israel, said 19 people had arrived in recent days, among them a rabbi carrying a 500-year-old Torah scroll. The non-profit organisation said some 50 Jews had chosen to stay in Yemen. Since 1948, 51,000 Jews have emigrated to Israel from Yemen, which has one of the world's oldest Jewish communities. Almost all of them were brought to Israel as part of Operation Magic Carpet in 1949 and 1950. n recent years, some 200 Jews have left as attacks against the Jewish community have increased and the country has descended into war. The Jewish Agency announced on Monday that the group landed in Israel on Sunday night following a "complex covert operation". "Nineteen individuals arrived in Israel in recent days, including 14 from the town of Raydah and a family of five from Sanaa," a statement said. "The group from Raydah included the community's rabbi, who brought a Torah scroll believed to be between 500 and 600 years old." The Jewish Agency said attacks against Jews in Yemen had risen sharply since 2008, when Jewish teacher Moshe Yaish Nahari was murdered in Raydah. In 2012, Aharon Zindani - whose son and four other relatives were on board Sunday's flight to Israel - was murdered in Sanaa and a young Jewish woman was abducted, forced to convert to Islam, and forcibly wed to a Muslim man, it added. After the conflict between the Yemeni government and the rebel Houthi movement escalated a year ago, when a Saudi-led coalition intervened militarily, the Jewish community found itself increasingly imperilled and covert operations to spirit Jews out of Yemen were stepped up. The Jewish Agency said some 50 Jews remain in Yemen, including approximately 40 in Sanaa, where they live in a closed compound adjacent to the US embassy and enjoy the protection of Yemeni authorities. Both the capital and Raydah are controlled by the Zaidi Shia Houthi movement, whose slogan is: "God is great. Death to America. Death to Israel. A curse on the Jews. Victory to Islam." 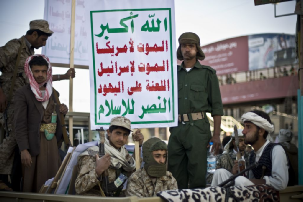 Armed Houthi rebels in Sanaa carry a poster saying: The Houthi rebel movement's slogan is: "God is great. Death to America. Death to Israel. A curse on the Jews. Victory to Islam." Sunni jihadist militants from al-Qaeda and Islamic State (IS) have also gained ground by taking advantage of the unrest. The Chairman of the Executive of the Jewish Agency, Natan Sharansky, said the arrival of the final group of Jewish immigrants from Yemen was "a highly significant moment in the history of Israel". "From Operation Magic Carpet in 1949 until the present day, the Jewish Agency has helped bring Yemenite Jewry home to Israel. Today we bring that historic mission to a close." "This chapter in the history of one of the world's oldest Jewish communities is coming to an end, but Yemenite Jewry's unique, 2,000-year-old contribution to the Jewish people will continue in the State of Israel." Al-Iryani said that the loss of the vast majority of the country’s Jewish population was a blow to Yemen’s heritage and culture and that the Yemeni government hopes to reestablish a relationship with the Yemenite Jewish community that left the country, Israel Radio reported. Houthi Shiite fighters wearing army uniforms ride on a pickup truck as they guard a street during a demonstration in Sanaa, Yemen, January 23, 2015. In March 2016, 17 Yemenite Jews were brought to Israel in a covert operation by the Jewish Agency for Israel and US State Department as part of a decades-long “historic mission” to “rescue” the Jews of the country. The group comprised the final batch of approximately 200 Yemenite Jews brought to Israel by the Jewish Agency in recent years, the organization said. Similar initiatives in recent years have helped bring the last few remaining members of the community to Israel as the country descended into civil war. I sraeli Prime Minister Benjamin Netanyahu holds an 500 hundred-year-old Torah scroll as he poses for a picture with some of the Yemenite Jews who were brought to Israel as part of a secret rescue operation, at the Knesset on March 21, 2016. Saudi Arabia and several of its Sunni Arab allies launched an intervention in March 2015 to support President Abedrabbo Mansour Hadi after Iran-backed Houthi rebels and their allies seized control of large parts of Yemen including the capital Sana’a. The United Nations says more than 7,700 people have been killed over the past two years in Yemen, which also faces a serious risk of famine this year. Some 49,000 Yemeni Jews were brought to the nascent State of Israel in Operation Magic Carpet in 1949-50. Yemen coup could spell trouble for local Jewish community Sanaa’s Jewish community lives in a guarded district under the protection of the central government, after fleeing to the capital from the town of Saada following by the Houthis in 2007. Jews have lived in Yemen for over 2,000 years. In 518CE the King converted to Judaism when. In 525/530CE it was captured by the Ethiopians and became Christian. About 630 it became Muslim. In the 10th century the ‘Orphans Decree’ was introduced as part of a strict interpretation of dhimmis. Jewish emigration to Palestine began in 1881 and continued almost without interruption until 1914. During this time about 10% of Yemenite Jews left. In 1947, after the partition vote of the British Mandate of Palestine, a pogrom in Aden killed 82 Jews and destroyed hundreds of Jewish homes. As most Jewish stores and businesses were destroyed. Aden's Jewish community became economically paralysed, In early 1948 the unfounded accusation of the ritual murder of two girls led to looting.